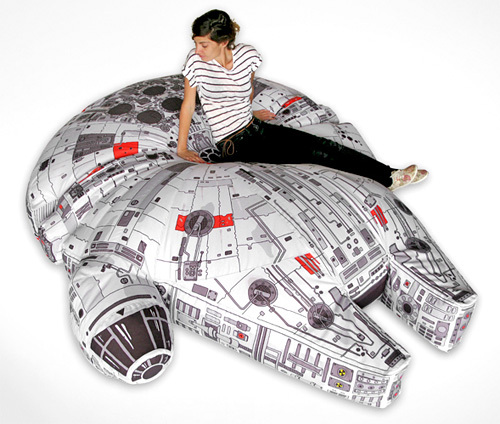 Custom-Made Millennium Falcon Bean Bag Chair Will Never End Up In A Galaxy, Or Living Room, Near You | OhGizmo! Umbrella Chair Brings Ultimate Comfort Outside. I almost feel bad about posting this amazing Millennium Falcon bean bag chair because as far as I can tell it was a one-off custom design created for an Adidas’ pavilion at the 2010 Sónar Festival. Made by Woouf!, masters of the fine art of bean bagging (that’s what it’s called right?) this version of the Falcon measures over 8 1/2 feet long, and looks a lot more like the ‘real’ thing than this Falcon bed we brought you a few years ago. The chair was created to tie-in to Adidas’ line of Star Wars themed sneakers they came out with a while ago, but sadly I see no indication that it’s available for sale to the public. Which is too bad because I suspect Woouf! could demand a hefty pile ot republic credits for them and still easily sell out. ← IPEVO Cushi iPad Stand – Because Your Tablet Deserves To Be Comfortable Too! Greatest media room seat ever!